The ULTRA BRUSH is totally different than standard camel hairbrushes. Its unique fibers are ultra-soft allowing for the cleaning of delicate surfaces of camera lenses, binoculars, telescopes and other fine optics. The ULTRA BRUSH fully retracts within the base to completely protect the brush ends. Guaranteed to be the softest lipstick style brush you can buy. These brushes are perfect for cryomicrotomy – for controlled manipulation of frozen sections in the cryostat, as well as cryomicrotome. Easier to clean than animal hair brushes and more durable, they come in 4 sizes: ¼", ½", ¾", and 1" for large sections. These brushes are available individually or in a set of all 4 sizes. A twill jean cotton wipe made from 100% cotton fiber that is woven in an extremely tight construction. The extractable trace elements are effectively reduced in the cleaning process which removes impurities in the cotton as well as any starches or binders used in the manufacturing process. These wipes are made from 100% synthetic fiber and spunlaced to provide excellent sorptive capacity. These durable wipes are exceptionally clean and have excellent chemical resistance, making them ideal for use with solvents. Recommended for use in ISO Class 5 Cleanroom applications. For superior cleaning of delicate surfaces. Based on advanced microfiber technology, the Dust-Off® Microfiber Cleaning Cloth is a superior cleaning product. It actually gets under dirt and oily films and lifts them away, leaving the surface clean, polished and lint free. Ideal for: Camera, Lenses/Filters, Microscopes, Computer, Eyeglasses, Plastic, Metal, or any smooth surface. Cotton woven cloth in the pattern of 44 x 36 (44 lines/inch horizontally and 36 lines/inch vertically) which makes it suitable for cleaning and polishing. Supplied in 60 yard rolls (continuous) 36" in width; This configuration allows you to cut out the exact length you desire. A large size towel (13.3"x23") suitable for many uses around the lab. High absorbency and strong, even when wet. Soft, highly absorbent, non-abrasive, and economic. Same characteristics as above wipes. 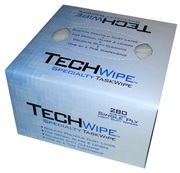 280, 4½ x 8½" wipes in each dispenser box. Same characteristics as above Kimwipes. Larger size for bigger applications. 140, 15" x 17" wipes in each dispenser box. Fabricated of durable plastic, these holders will serve for year of use, yet are inexpensive enough to have in every convenient spot in you lab. Combo-Dispenser is also available for your convenient. Designed to hold most brand of wipes and gloves. Combo dispensers come with color white only. This holder is a molded one-piece, hard plastic with a center island. Once the Kimwipes box is placed inside of this holder, Kimwipes will maintain in an up position until the last one is pulled out. Very handy for laboratory work bench, desk top or any work place. No more digging for tissues Remove perforated oval on bottom as well as top Align bottom opening with push-up column Cutaway views shows push-up action Tissues stay at the top of box down to the very last one. Care of the Cloth: Machine or hand wash and dry. The unique properties will not change. May be ironed with cool iron, if desired. A strong hydro-entangled mixture of polyester and cellulose fiber; designed for clean room environments. This special material offers softness, is lint-free, and traps particles and residue quite easily. EMS (Formerly Ross) Lens tissue does not lint or scratch and it is free from mineral or vegetable filler. 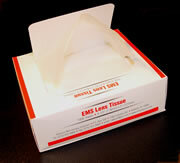 EMS Lens Tissue is the world's finest optical tissue. It's extremely soft and virtually lint-free. Safe for any optical surface such as camera lenses, microscopes, telescopes, and eye-glasses. Each tissue is perforated for easy removal from the booklet. 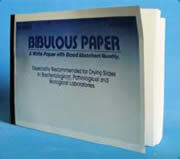 Tissue size: 4"x6", 50 sheets/bk. A unique solution for cleaning optical lenses. The full-size Pen-tek comes with a round, concave tip for lens and filter cleaning. The round, concave cleaning tip is designed to clean digital camera filters, digital cameras, binocular lenses, watches, eyepieces and other optical items. Semi-triangular shaped tip to clean into the corners of the screen. Designed specifically to clean the small digital glass and LCD screens, general lenses, PDAs, cell phones, etc. Round and flat cleaning tip is designed to clean filters for digital cameras, video cameras, and more. The MicroPen-tek safely and effectively cleans micro camera lenses. With its specially designed flat and round micro-tip, it applies the invisible carbon compound to places its bigger brother can't reach. Retractable brush removes dust and the unique invisible carbon compound outperforms all other cleaning systems. Featuring outstanding cleaning ability, the label and adhesive remover pen offers control and exact application with a mild citrus aroma. It provides general purpose cleaning and refurbishing of equipment, ink stain, label adhesive, and difficult soil removal. Good for removing cured or uncured epoxy resins. This compact portable vacuum cleaner helps keep your desktop or work surface nice and clean. It's patented nozzle gets between computer keyboard keys, card reader slots and other hard to reach crevices. The strong suction power collects dust, food-crumbs and even staples with ease. Powered by 2 AA batteries (not included). Dim: 7 x 1.3 x 1.5", weighs 3 oz. Contains no silicone. Good for cleaning EM parts. A blue paste. Grit Distribution: Particles over 45µm diam = 0-5%; 45-10µm diam = 20-40%; 10-1.6µm diam = 10-30%; under 1.6µm diam = 40-60%. Vook, R.W., Kothari, R. (1992). Wear, 157, 65-79. A metal polishing compound used to clean and polish all metal surfaces. Replaces Pinky Metal Polish. Petroleum based without silicone. Not recommended for using on soft metals (aluminum, etc.). 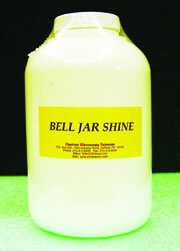 A gentle liquid polish for metals such as aluminum, brass, copper, stainless steel. The polish can be applied with a wipe or directly to the surface. A thick abrasive paste for cleaning and suface finishing. Good for removing stains on enamel, glass and metal. Can be applied to cotton swabs or wipes for polishing. Test first before using on soft metals. A thinner paste for use on stainless steel and surfaces. Can be applied with a wipe or directly to the surface. A metal polishing compound used to clean all metal surfaces. EMS is proud to introduce PEEK, a complete new line of cleaning materials that not only clean, but polish and protect all metals, as well as fiberglass surfaces. Available in 5 different packaging configurations. This unique cleaning compound will not only clean but it polishes as well. Meant to be used on any surface which is either glass, metal, porcelain, ceramic and even chrome surfaces. Perfect for the cleaning of your bell jars from your Carbon and Sputter Coaters, as well as any surfaces in the lab that are metal, ceramic, steel, etc. Comes in a 1 lb container. A multipurpose anti-static foaming cleaner. Ideal for general cleaning on a wide variety of Laboratory, industrial, aerospace and commercial equipment. Removes tough, stubborn stains such as grease, grime, and dirt. 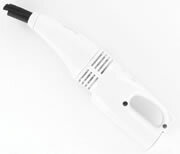 Anti-static formulation, reduces the attraction of airborne dust. A thickness of 0.001" "PTFE" film bonded to 0.008" self-adhesive vinyl. It protects your work surface area and it is sanitary and attractive. Easy to use: cut to desired size, remove the backing and press into place. Neutralize & Protect – Nanoscale Silver particles bind with proteins to neutralize 99.9% of common microbes. Better Results – Ensure consistant sample reproduction and results by significantly minimizing workspace contamination. Reliable – Silver is used extensively in medical applications where microbial contamination is a concern. Use Anywhere – Mats are less than 1mm thick and are backed with an anti-skid coating making them perfect for the benchtop or culture hood. They are round and double tapered; used for cleaning pole pieces and parts of the EM. Also used for orienting the specimen during the embedding stage. Designed for specimen transfer, or as mixing rods or general laboratory applicators. These sticks are made from close-grained northern white birch because of its ability to provide a smooth and polished surface. Used for mixing, stirring, or scraping epoxy resins. A lint-free, cotton-tipped applicator 6" in length, 1/12" in diameter on a wooden shaft. Head size is 3/16" (dia) x ⅝" (L). Suitable for cleaning delicate parts. A lint-free, 6" double cotton tipped applicator with one pointed end and one regular end on a 1/12" wooden shaft. The pointed head size is 3/16"(D) tapering to 1/32"(D) x ⅝"(L). Regular head size 3/16 (D) x ⅝" (L). Packed 100 sticks in a sealed bag. Thirsty-Swabs may be squeezed and reused. Upon squeezing out any liquid, Thirsty-Swabs will retain approximately 80% of their absorbency. These foam tipped applicators are lint free, non-abrasive, and sized for precision cleaning with solvents. (Freon, Trichloroethane, Isopropyl Alcohol, and Acetone). The head is made from 100% urethane foam with 100 PPI porosity. Tips are shred resistant and bonded securely to the shaft. 72312 is round, foam-tip over regular-cotton tip on a 6" long wooden shaft. Head size:⅜" (D) x 1-3/16" (L). Packed 50 sticks in a sealed bag. 72314 is rectangular, foam-tip on a 5" polypropylene shaft. Head size: 1-1/16" (D) x 1" (L). Packed 50 sticks in a sealed bag. 72316 is an anti-static foam-tip over cotton tip on a 6" wooden shaft. Head size: ⅜" (D) x 1-3/16" (L). Packed 50 sticks in a sealed bag. Available in three sizes: 1mm, 2mm, and 3mm. ESD safe. Dust-free sticky swabs are specially used and designed for a high degree dust-free environment (class10-100). Anti-static treatment can safely dissipate electrostatic charge. Sticky swabs are applicable for manufacturing and assembling static sensitive products. OAL: 70mm, PVC. Kit contains 25 of each size. Durable wrapped foam swabs designed for precise applications provide good particle entrapment and work well as solvent applicators. The small tips on many of the styles allow use in very tight tolerance areas. With the most durable head of any foam swabs, wrapped foam delivers superior abrasion resistance for removal of tough contaminants. Wicking action pulls solvent from surfaces. The small tip allows use in very tight tolerance areas, while the pointed end works especially as pick. Nylon handle. Very clean and durable all-purpose swabs (knit or nonwoven fabric heads) are acid and solvent resistant. Sealed edges build in high strength with no loose fibers or particulates. They are ideal for tough scrubbing around raised shapes. Cleanroom process gives you the lowest ionic, non-volatile residue and particle contaminants. Polypropylene handle. Economical general purpose swabs. Best solvent retention. The most cost-effective swabs for general purpose applications.100 ppi reticulated medical grade foam provides excellent particle entrapment. The open cell structure gives the best solvent holding ability of any style of swab. These swabs are free of adhesives or binders that could contaminate your process. Fiberless construction does not generate particles. Round Tip. Economical general purpose swabs. Best solvent retention. The most cost-effective swabs for general purpose applications.100 ppi reticulated medical grade foam provides excellent particle entrapment. The open cell structure gives the best solvent holding ability of any style of swab. These swabs are free of adhesives or binders that could contaminate your process. Fiberless construction does not generate particles. Pointed Tip.